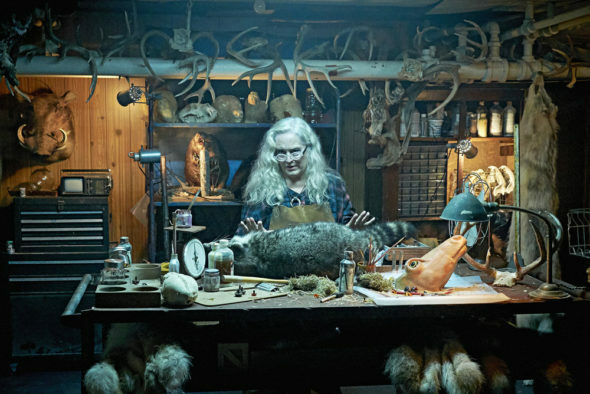 Channel Zero on Syfy: Cancelled or Renewed for Season Four? Is this horror anthology series on the chopping block? Will the Channel Zero TV show be cancelled or renewed for a fourth season on Syfy? The television vulture is watching all the latest cancellation and renewal news, so this page is the place to track the status of Channel Zero, season four. Bookmark it, or subscribe for the latest updates. Remember, the television vulture is watching your shows. Are you? What’s This TV Show About? Airing on Syfy, each season of Channel Zero tells a new story featuring different characters. Season three, Butcher’s Block, stars Olivia Luccardi, Holland Roden, Rutger Hauer, Brandon Scott, and Krisha Fairchild. Based on Kerry Hammond’s creepypasta, “Search and Rescue Woods,” it follows sisters Alice and Zoe Woods (Luccardi and Roden), who move to a new city. Soon, they learn of a series of mysterious disappearances and discover that something is preying upon the locals. The third season of Channel Zero averaged a 0.09 rating in the 18-49 demographic and 308,000 viewers. Compared to season two (No-End House), that’s down by 38% and 24%, respectively. Find out how Channel Zero stacks up against the other Syfy TV shows. On February 9, 2017, Channel Zero was renewed through its fourth season with a premiere date TBD. Stay tuned for further updates. Want to automatically receive updates about this TV show? Sign up for our FREE email alerts. Although the third season drew much lower numbers than last time out, fans shouldn’t spend too much time worrying whether Syfy will cancel or renew Channel Zero for season four, since the cable network picked it up through the next installment, last year. I’ll update this page with breaking developments. Subscribe for free Channel Zero cancellation and renewal alerts. TV show ratings are still important. Follow Channel Zero‘s weekly ups and downs. Check the rankings for Syfy’s scripted TV shows. How do this show’s ratings compare to the network TV shows? Find more Channel Zero TV series news or other Syfy TV show news. Don’t miss our other TV show status pages. Check out our lists of already cancelled and ended TV shows. What do you think? Do you hope the Channel Zero TV show will be renewed for a fourth season? How would you feel if Syfy cancelled this TV series, instead? More about: Channel Zero, Channel Zero: canceled or renewed?, Channel Zero: ratings, Syfy TV shows: canceled or renewed? Van Helsing on Syfy: Cancelled or Renewed for Season Four? Z Nation: Cancelled or Renewed for Season Six on Syfy? Channel Zero Is the Syfy TV Show: Cancelled or Renewed for Season Five? The Magicians on Syfy: Cancelled or Renewed for Season Four? Van Helsing: Cancelled or Renewed for Season Three on Syfy? Z Nation on Syfy: Cancelled or Renewed for Season Five? Ghost Wars: Cancelled or Renewed for Season Two on Syfy? Wynonna Earp: Cancelled or Renewed for Season Three on Syfy? The Expanse: Is the Syfy TV Series Cancelled or Renewed for Season Three? Channel Zero: Cancelled or Renewed for Season Three on Syfy? Dark Matter: Is the Syfy TV Series Cancelled or Renewed for Season Four? Incorporated: Is the Syfy TV Series Cancelled or Renewed for Season Two? Please renew this TV show! A lot of people probably are not even aware the show is on but if they knew they would be hooked! It is the best thing on television right now next to The Walking Dead and Fear The Walking Dead! Please please renew this TV show so that I have something to watch! LOVE IT! No surprise here. Since FAILURE is Acceptable at SYFY, why should anyone be shocked that a show currently averaging a 0.10 be renewed for a 4th season? This network is so pathetic that it is disgusting.